Finding it hard to get your child into bed? Fun furniture will help with creative playtime to keep the children entertained as their imaginations run wild. Lots of fun to be had sleeping in a theme bed too. 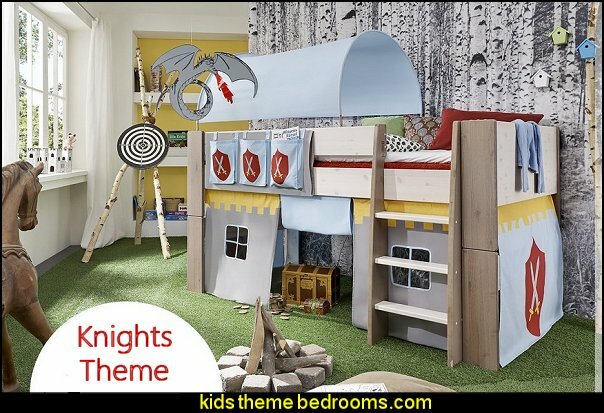 For theme bedroom decorating ideas visit kids theme bedrooms, packed full of theme bedrooms and theme decor, furniture, bedding, murals and more, to help you create the perfect fantasy themed bedroom furnished with a novelty theme bed. Also have a good browse around this blog site for more fun decorating ideas, picture paints a thousand words, and there's lots of pictures. 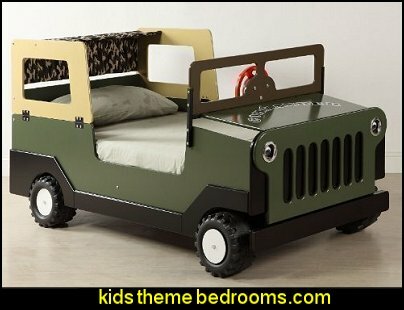 Boys bed is made especially for rough and tough little boys, it will bring a lot of entertainment and enjoyment to your child's play time. The Neptune II youth collection boasts a nautical theme with its unique design and finish. Perfect for ocean lovers, the boat shaped bed creates a relaxing and cozy environment for your beloved little ones. The headboard and footboard feature spacious compartments for placing books, magazines, and other collectibles. The optional storage drawers and trundle bed offer extra storage room or sleeping space, meeting all your needs. Anchors aweigh! 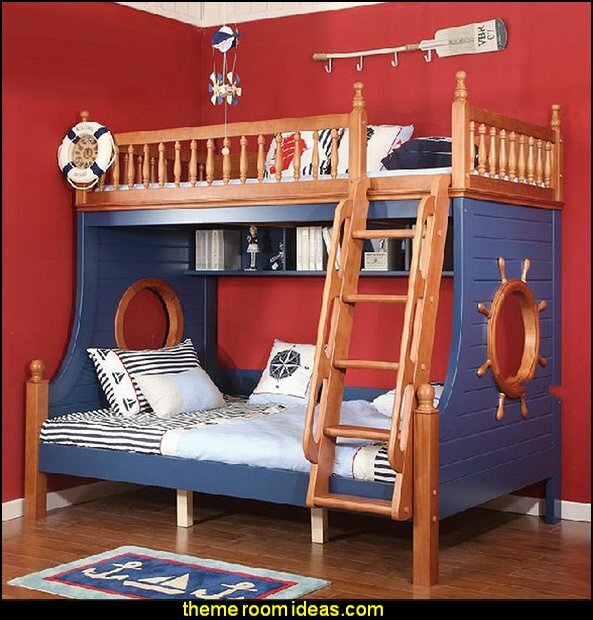 This lovely twin bed is inspired by the captains and sailors of the sea. Practical with its included trundle, Two drawers and front storage, it is not only about fun but also about function. A combination of white, oak and navy blue finish tops this exciting bed. Come on, Robin, to the Bat Cave! Turn your sports fan's room into his dream room with a MLB Bunk Bed. 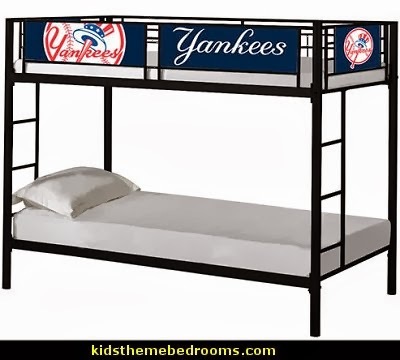 Featuring the NY Yankees or Boston Red Sox official logo and graphics on the upper level, and a sleek black metal frame, this bunk bed will give his room a neat look. The upper and lower beds allow for twin size mattresses, and with dual side ladders your son will have easy access to his top bunk. 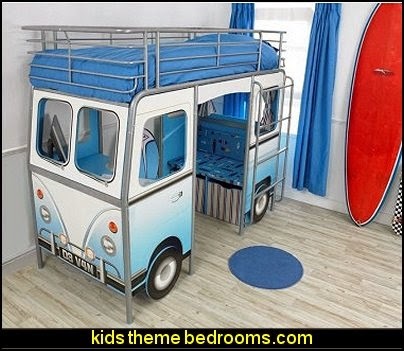 With a bunk bed like this, your son will want to have guests over just to show it off. 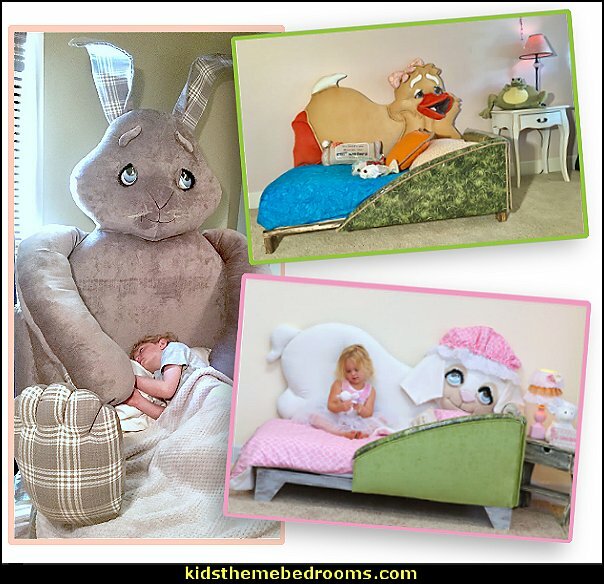 When it comes to furnishing your child’s room, selecting inspiring furniture is only a part of the picture. The magic is how you bring it all together. 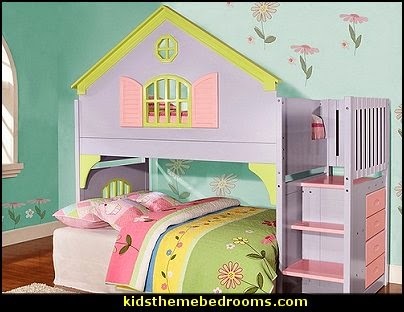 This lovely Garden style loft theme doll house bed makes you feel the breeze, see the trees, and smell the lilacs! Cottage-like style theme bedroom furniture. Your young lady will be eager to climb into her bed, and will soon be transported to the faraway land where the flowers bloom and sweet dreams lie! 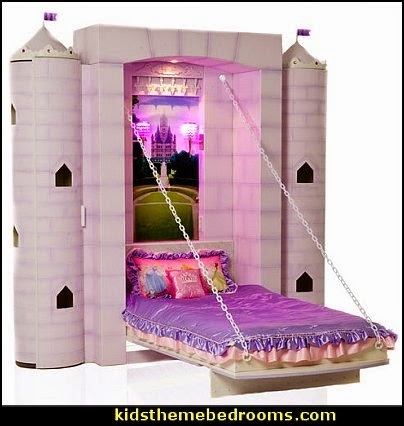 With this one of a kind Guinevere Castle bed Bunk Bed your darling daughter will to go to sleep like a real little princess. 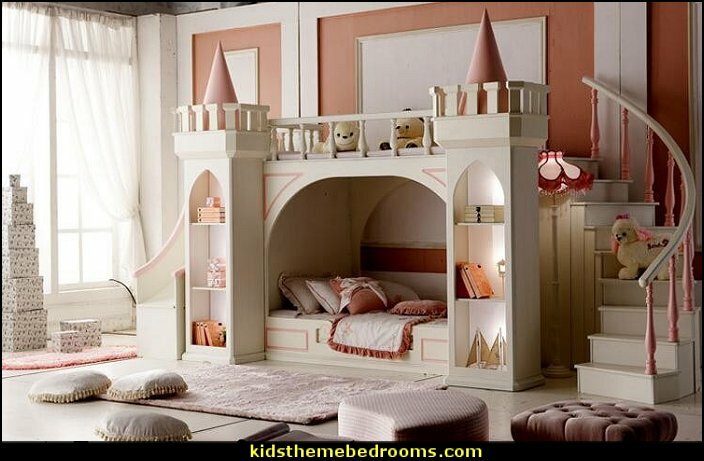 Featuring spectacular castle-like construction in beautiful color hues, this unique castle bed is something special. This extraordinary full over full bed is loaded with delightful features including; a spacious bookcase, inside access to an 8-sided tower with shelves and additional shelves in rear tower - just like the old-time castles! So watch your little ones climb into bed and drift off into dream land where kings and queens reign, assisted by their little princesses!! Castle beds fit for a Princess! Enchant your little princess with the bunk bed of her dreams, with this charming Polton Castle Bunk Bed. Its beautiful hand painted pink floral design, will add a most delightful look to your fairy tale themed bedroom. With loads of windows for your little princess to observe her surroundings, and a bookcase tower with drawers for her belongings, your darling is sure to love her new abode. Complete with an access ladder to reach the top bunk and a curvy slide to wiz down in the morn, your little girl eagerly run off to bed and wake with a bright smile on her face! 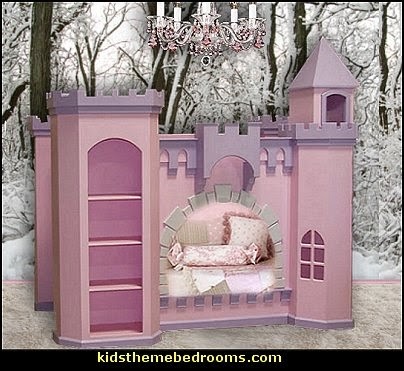 Your daughter's imagination will take her to far away lands where royal castles are the norm, with this extraordinary Anatolian Castle Bunk Bed. 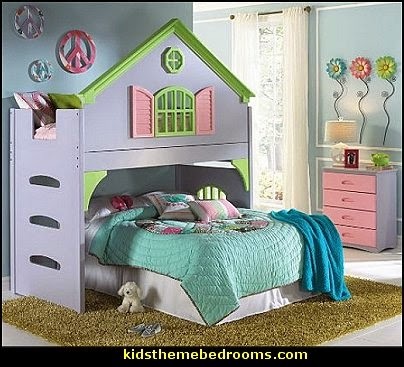 This unique bed with castle-like construction in hand painted beautiful color hues is designed to take advantage of rooms as narrow as ten feet! 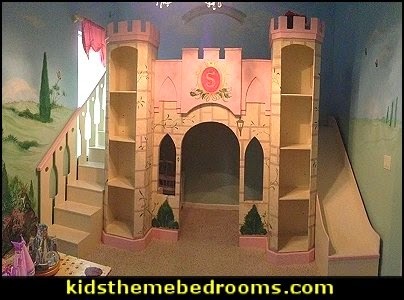 This spectacular twin over twin bed is loaded with delightful features including; a spacious bookcase tower, inside access to adjustable shelves in an octagonal storage tower with cathedral windows, and adjustable shelves in the accessory tower tucked behind the staircase - just like the old-time castles! So watch your little girls climb up the wrap around staircase and drift off into dream land where princesses rule! 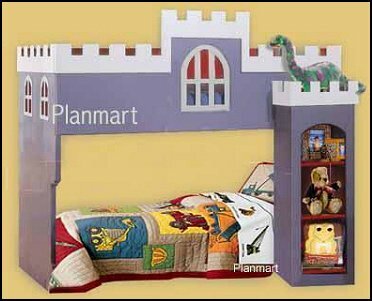 With this one of a kind Lancelot Norwich Castle Bunk Bed your little prince will to go to sleep, specter in hand while building castles in the air. 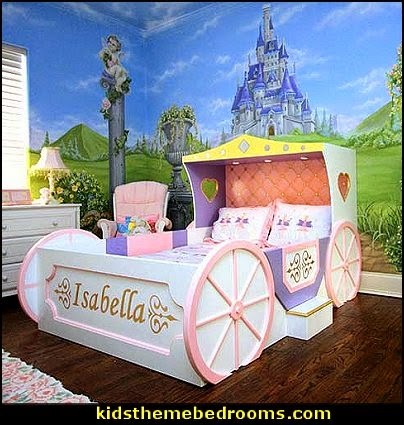 Featuring spectacular castle-like construction in a beautiful hand painted finish, this unique castle bed is something special. So watch your little ones climb into bed and drift off into dream land where kings and queens reign, assisted by their little princes!! Fit For a True Princes and Princesses!! Your Royal Heir to the Throne will to go to sleep like a true royal charge with this deluxe King Richard Norwich Castle Bunk Bed. This castle loft bed with its spectacular castle-like construction in a beautiful hand painted crackle paint finish, is truly something special. This extraordinary full over full bed is loaded with delightful features including; a spacious bookcase, inside access to an 8-sided tower with shelves and additional shelves in rear tower - just like the old-time castles! 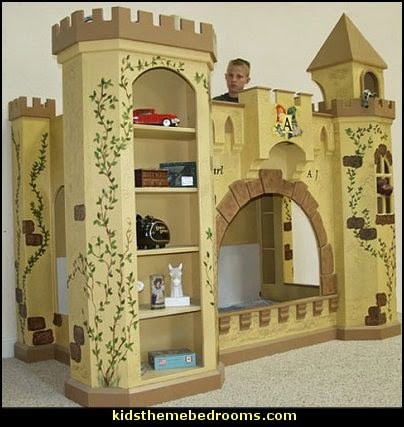 So watch your little ones clamor into bed and drift off into dream land as they build castles in the air!! 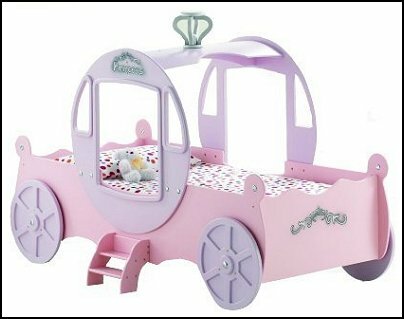 This spectacular fairytale coach is hand crafted in the most adorable and authentic looking carriage shape and is hand painted by the finest designers. A Fairy Tale Dream Come True! 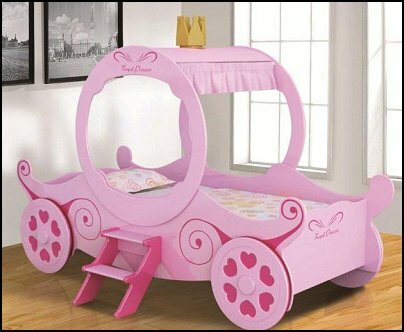 Your little princess will be enthralled with our Princess Carriage Bed, straight out of a fairy tale! This glamorous carriage, featuring a stunning hand-painted design, will transform your little one’s room into an enchanting wonderland! Your darling will feel like royalty as she steps up into her regal carriage and is off to dreamland! Romantic and inspiring, this princess carriage bed is the finishing touch to any royal bedroom and offers grandiose inspiration for dreamers. The bed features a carriage style metal framework that swirls and twirls in a mixture of white and pink. 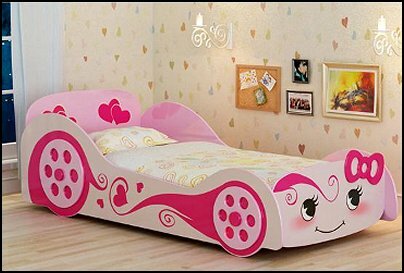 An Enchanted Bed for your Princess! 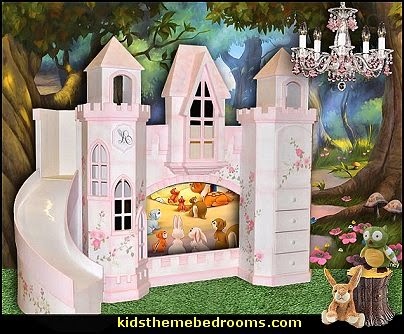 With a unique drawbridge design, magical artistic details and princess accent lighting, this wall bed is the ultimate dream come true for little princesses. The bed is easily drawn up for added play space every morning, perfect for small living quarters. The princess themed LED lighting has a remote control function, and has four color settings. 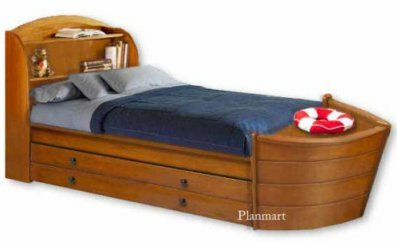 Flanked on both sides of the bed are two grand towers revealing extra storage shelves and featuring leveling feet to accommodate uneven floors. Made of only durable and flexible material, you can be sure this bed will last for many years of magical sleep and play. 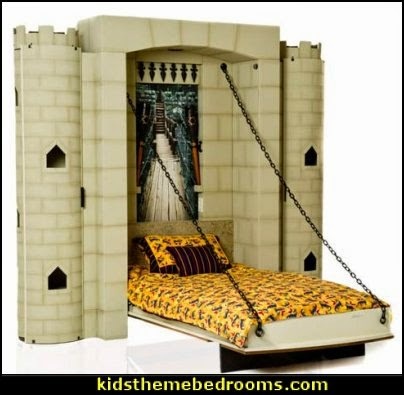 Your little squire will love this exciting and authentic castle wall bed. The unique drawbridge design features a commercial quality spring mechanism that is safe and easy to use, even your child can raise his bed each morning. While the bed is tucked away it reveals plenty of play space, which makes this bed perfect for smaller living quarters. The authentic looking stone finish, hidden storage shelves and torch lighting, is designed to ignite your child's imagination. Hand crafted of only top quality material, this bed is durable and will last for years of great adventures. 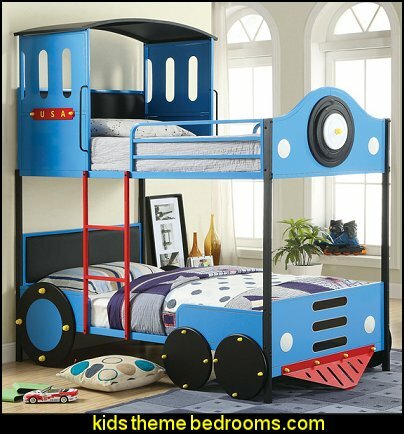 For the avid train enthusiast, this train-inspired bunk bed offers plenty of fuel for young imaginations. Featuring an all-over blue powder coated finish, the metal constructed bed is sure to be the focal point of any and all play dates. Red, white, black, and yellow accents can be found along the ladder, wheels and headlights. This twin over twin bed is a must-have for any child's room. The bight blue finish brings a colorful look to your child's room while the leathette padded headboard allows for easy sitting up to read, do homework and more. 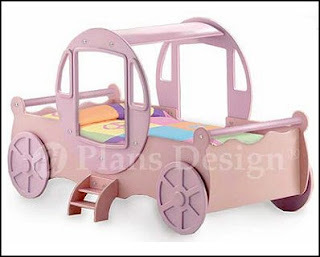 Safety handles on each side make this bed a safe option for your little one. 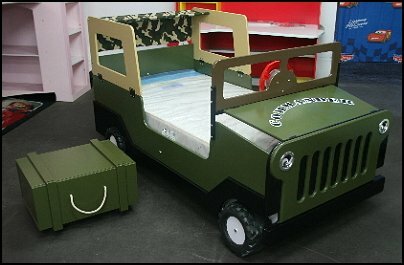 Allow your child to drift off to sleep dreaming of fun, train adventures with the addition of this bed to their bedroom. 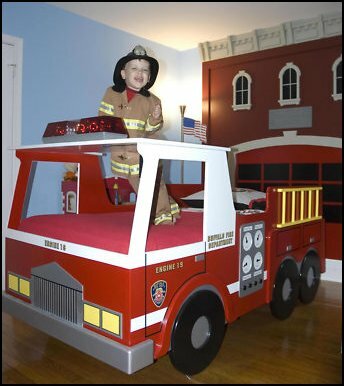 Spark creativity and enthusiasm within your child with this fire truck inspired bed. The metal frame features a life-like finish that will have your child zooming around in their dreams. 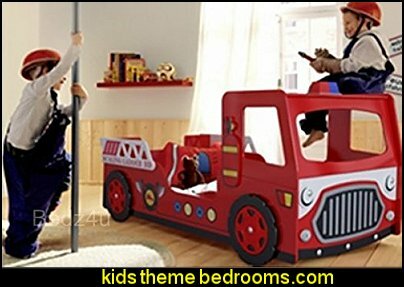 The fire truck bed is the ideal bed for the young fireman. This bed is truly built like a truck. It is designed to handle even the wildest fireman. The bed includes many features that make this bed unique. The features include an overhead roof to give the feeling of a real fire truck, a rear running board to step up into the bed. A standard twin size mattress fits into the bed. Bulldozer Bed (PLANS ONLY) in pdf format. 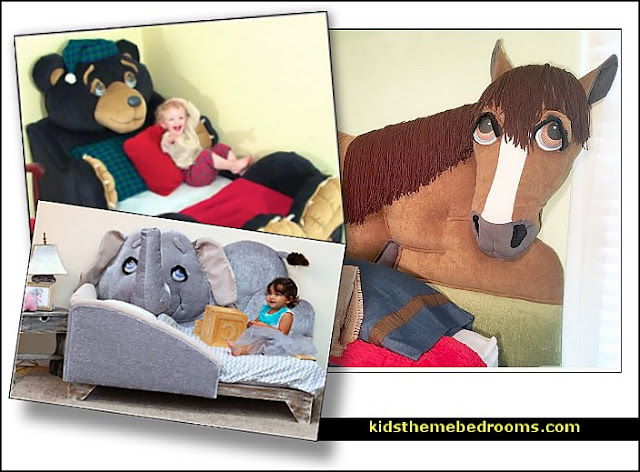 A project you can build so your little one can transition to a big-kid bed they will love to sleep in! This bulldozer bed plan set is designed for a twin size mattress (39" x 75" x 7"), but you could modify the build to accommodate a different sized mattress. These plans include many detailed diagrams and instructions, explaining each step very clearly. Finished bed dimensions are (90"L x 71" W x 61"H ) when built with tracks on both sides. Bed can also be placed against a wall with a track only on one side, making the width 59". The bed is designed to be broken down into pieces so it can be built in the garage and then easily transported to the bedroom and reassembled. The Front End Loader bed is designed to be constructed from birch plywood. The bed includes features that make this bed unique. 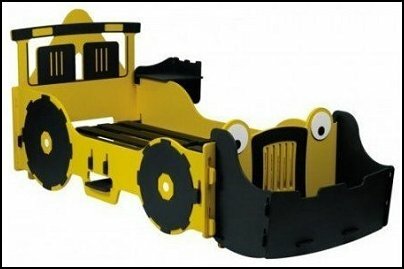 The features include an overhead roof to give the feeling of a front end loader and a front end scoop that can be used as a shelf or for toy storage. The train bed is designed to be constructed from plywood. The bed includes many features that make this bed unique. The features include an overhead roof to give the feeling of a real train engine, a rear hitch to step up into the bed and a cowcatcher that is also a toy box. 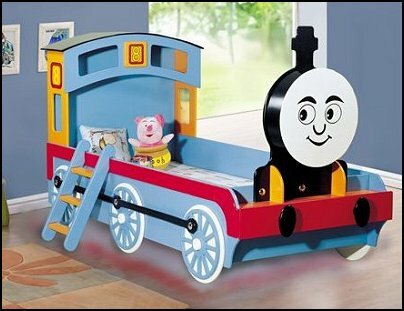 Any little fan will be thrilled with this magical tank engine bed for a train ride to dreamland. All aboard for a good night's sleep! 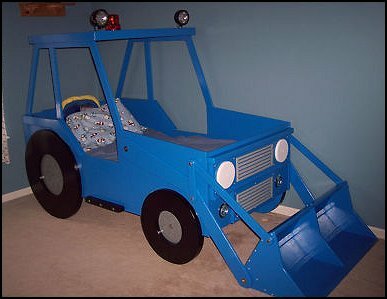 With a steering wheel and switch operated LED lights, what kid wouldn't want to sleep in this? 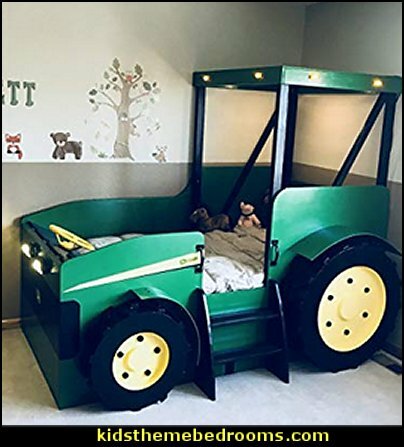 This tractor bed plan set is designed for a twin size mattress (39" x 75" x 7"), but you could modify the build to accommodate a larger mattress. These plans include many detailed diagrams and instructions, explaining each step very clearly. 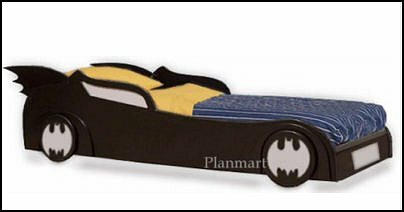 Plans are for awesome Bat mobile twin bed. Perfect for your little superhero. The bed is designed base on only one sheet of plywood or MDF board and you can build it in a few days using a simple tool. 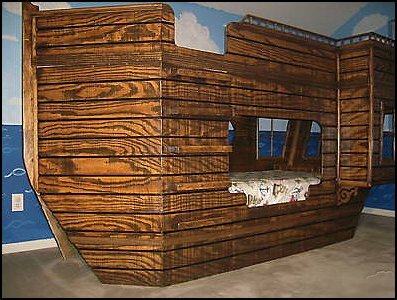 Decorate your child's room in style with this authentic looking pirate ship bed which is sure to inspire adventure. A bookcase headboard provides an abundance of bedside storage space that will help keep a busy child's room clean and organized. A built-in trundle bed is ready for sleep overnight guests, or for under-bed storage. Designed to be a combination bunk bed and play space. The bottom section fits a twin mattress, and the top section fits either a toddler mattress widthwise in the stern of the ship, or another twin mattress lengthwise. 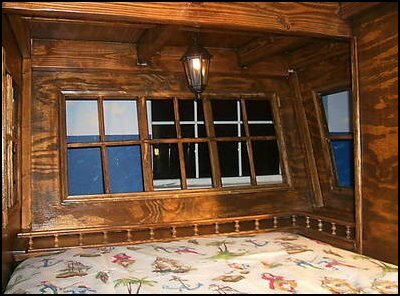 The bed features a beautiful Pirate Ship frame design, three portholes on the starboard side, a ladder that leads up to the top deck, and decorative trim work. 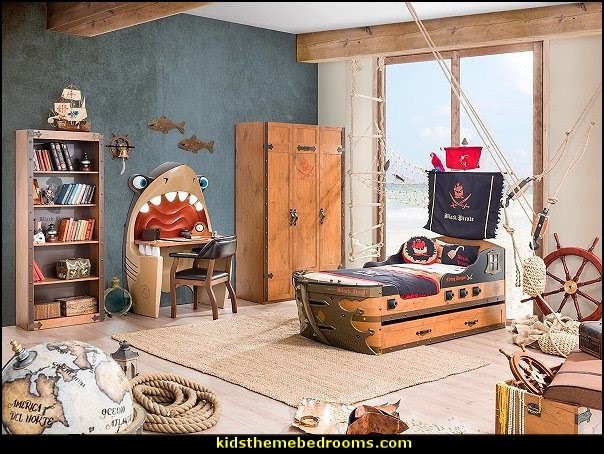 The Captains Quarters also includes separate space at both the foot and the head for storing personal items like bedtime books, an alarm clock, stuffed animals, or maybe extra cannons. This amzing castle twin over twin loft is designed to accommodate three options. You can either keep under bed attached as shown on the picture or detach it for play area or also full size bed can be placed under loft with L position. It is much fun to paint and it is easy to build! 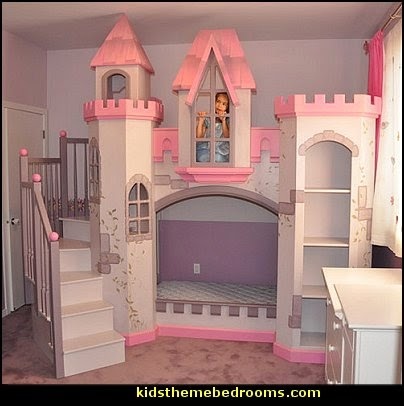 Consider a fairy tale castle scheme for a girl with pink accents or blue finish theme for a boy. 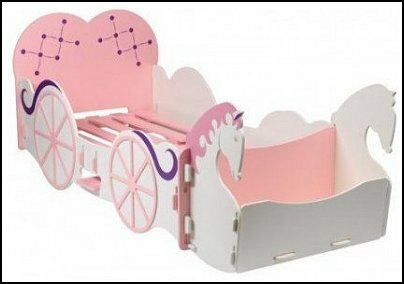 Your little princess will be thrilled with this fairy tale coach and will have magical dreams of living happily ever after. 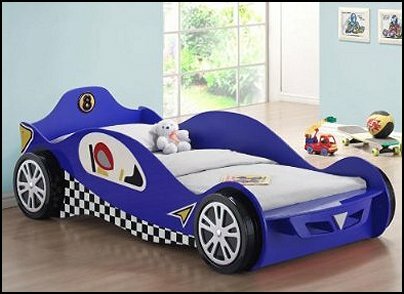 Fun bed for the little racing car enthusiasts. 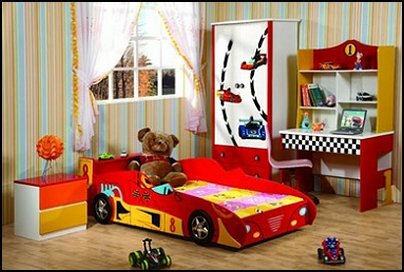 Transform your child's bedroom into a speedy pit lane. Available in black, blue and speedy red. Fire Engine is complete with Cab, dashboard shelf and turning steering wheel. 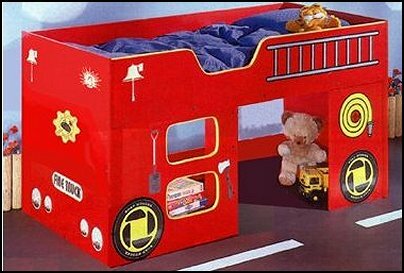 Fire Engine Bed finished in a bright red gloss finish which looks vibrant in any children's bedroom. 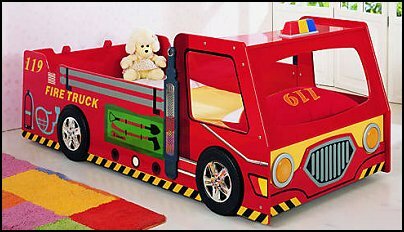 The friendly face of the fire engine bed will make children's bedtime much more exciting. 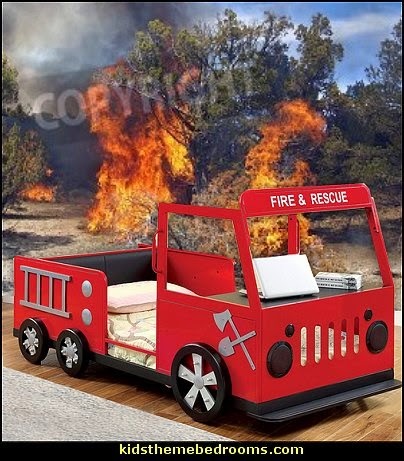 Fire Engine Novelty Bed with working lights. The Fire Engine is also complete with Cab, Dashboard Shelf and Turning Steering Wheel. By the press of a button the Engines L.E.D lights will instantly light up. (Battery operated). Features a fun, highly detailed design. 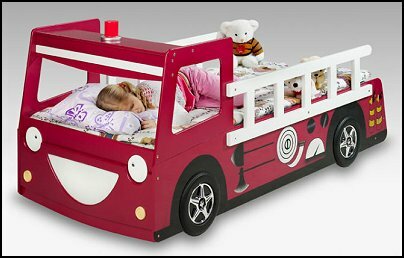 Fire Engine bed is a superb styled children's Fun bed. 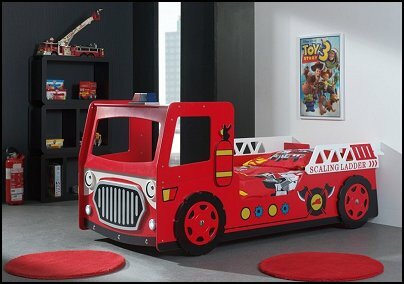 Fun Beds like this Fire Engine bed are more than a piece of children's furniture they are a play area as well as a bed. 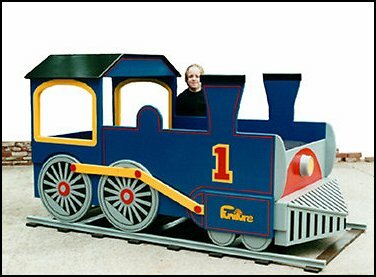 It’ll be ‘full steam ahead’ with this fun Train bed is for children who are about to get their first grown up bed, a delightful blue, and red train shaped fun bed. 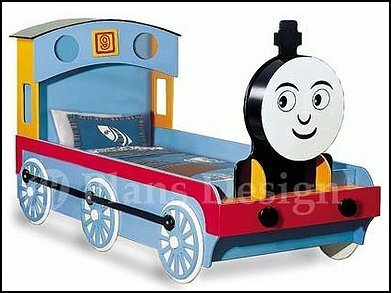 This Majestic fun train bed will be the centrepiece for any child's bedroom. 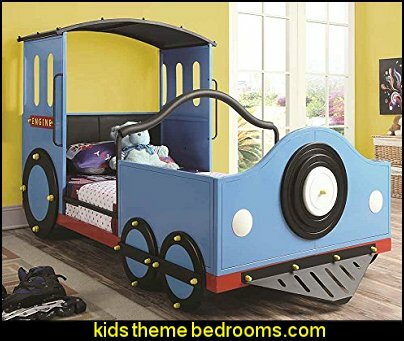 Perfect bed for the Thomas the Tank Engine fan's room. 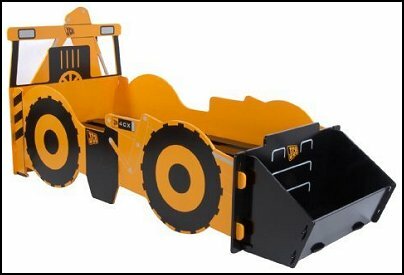 The digger bed is fun addition to your child's construction theme bedroom, a toy as well as a fun bed. 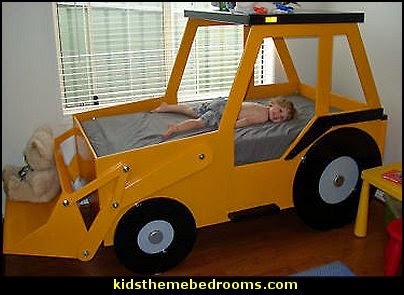 The 'men at work sign' style bedside is an ideal unit to have next to the digger bed in the construction theme bedroom. The skip style toy box is an ideal storage unit for all those little items your kids collect. The toybox comes in a JCB yellow painted finish. 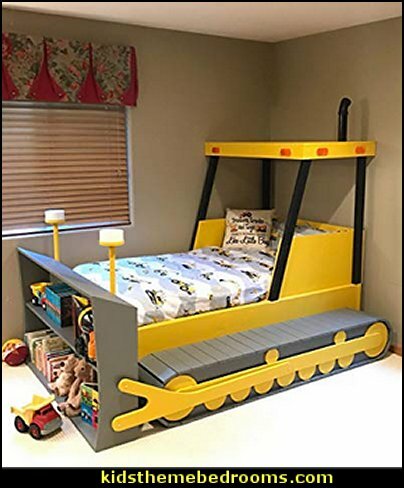 The Digger Bed in vibrant yellow and black will brighten up any little boys construction themed room. The bed comes with screen printed designs and is the perfect bed for your budding builder. 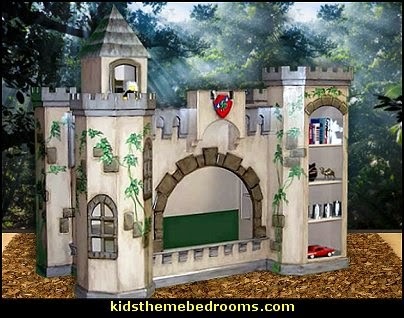 Turn an ordinary bedroom into an amazing imaginative adventure zone that kids will love to show their friends. 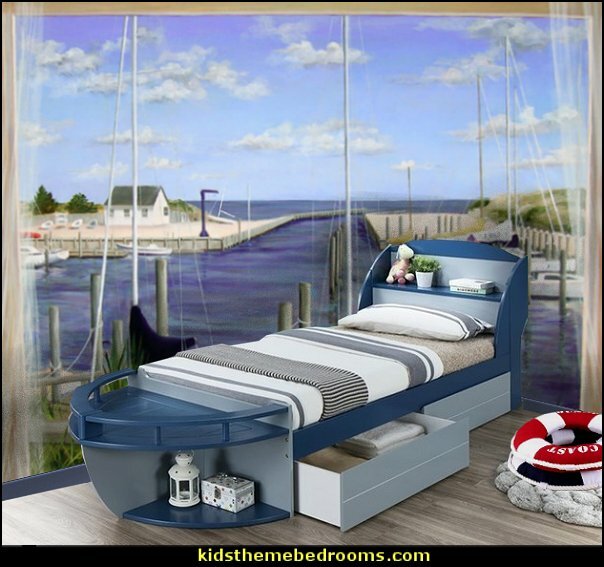 The Blue Racer Bed will allow your child's imagination to run wild and may actually encourage them to go to bed! Create a fun bedroom atmosphere with this blue gloss finish racer bed frame that is totally sturdy and comfortable, and sure to encourage any budding young racing driver! 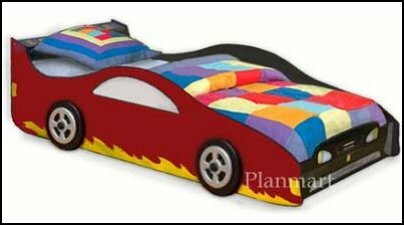 The Grand Prix Racing Car Bed is an attractive bed frame for any aspiring racing fan. The bed is finished in a high gloss paint on a sturdy MDF frame with fixed slats and supporting side rails. 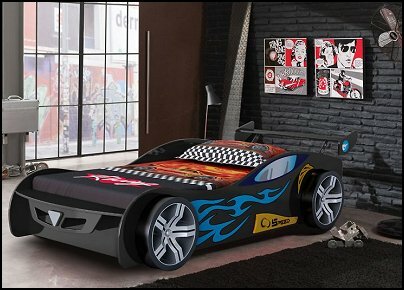 The Racing Car Bed shows attention to detail to the foot board and wheels, making it feel like a real racing car. 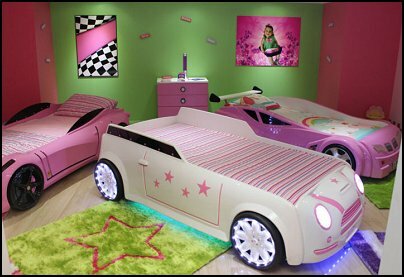 How cute are these furniture accessories to go with the car theme beds, ideal for the garage style bedroom. 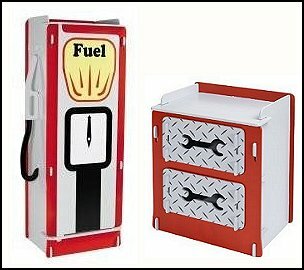 The Racing Car wardrobe is cleverly designed to look like a petrol pump, complete with the hose and handle on the side. The wardrobe is finished in grey and red colour. The drawer unit has been designed to look like a spanner chest and has plenty of storage for your little ones bits. The 2 drawer unit is finished in grey and red colour. 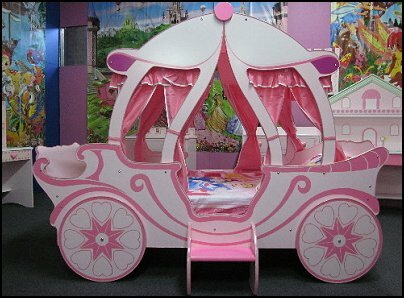 Fairytale Princess Horse drawn Carriage Bed. 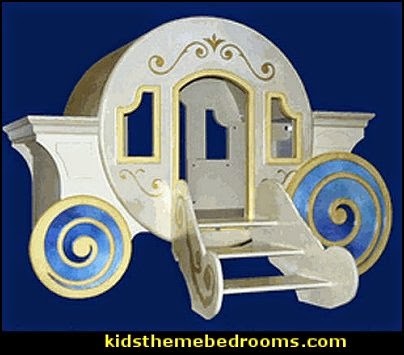 This pretty bed is in the shape of a fairytale princess horse drawn carriage and has a handy storage area for toys and books. This beautiful princess carriage bed is finished to look just like a wonderful horse-drawn carriage. A Pretty pastel pink and lilac with a beautiful carriage design. 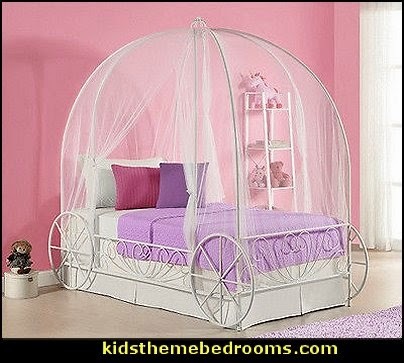 A must have bed for any little princess, she will be made to feel like a real princess climbing through the carriage door. 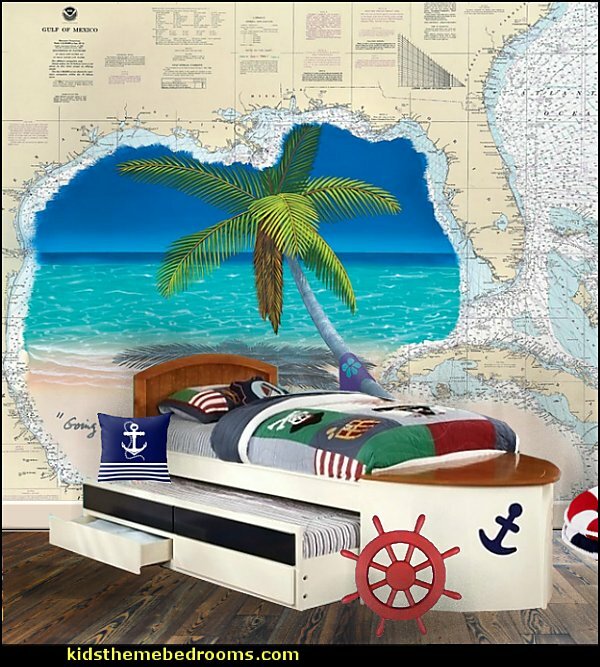 Encourage your child’s imagination to set sail on the high seas with this fantastic pirate-themed bed. 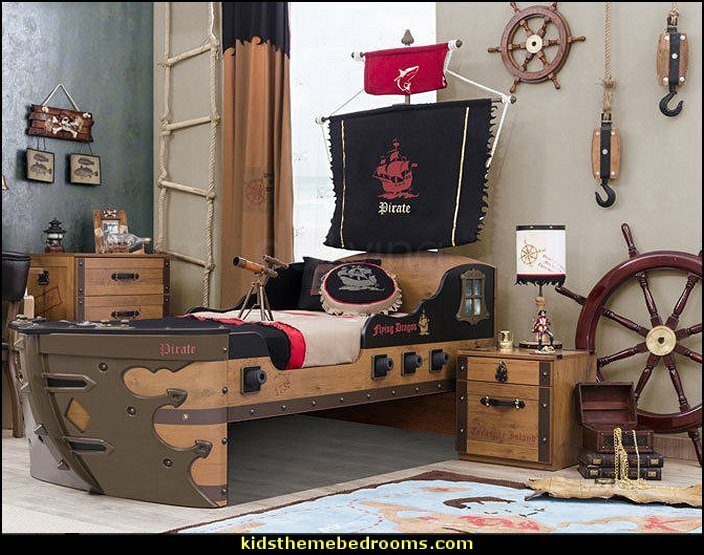 Sail the high seas in this pirate themed single bed. Inspire your little ones with furniture they can enjoy as part of play. 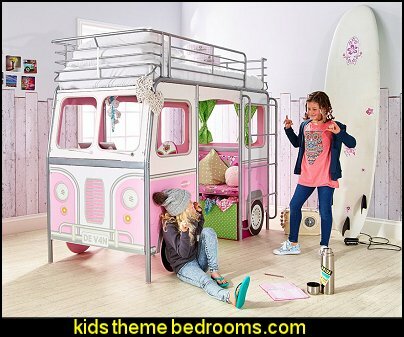 This unique retro-styled De Van® Blue Cabin Bed instantly creates a laid back and chilled atmosphere in any child’s room and turns an ordinary bedroom into a fab cool zone that kids will love to hang out in and show off to their friends! When kids look into the camper’s cab they’ll see a useful desk area which is ideal for getting on with homework in peace, surfing the net or getting creative! When it’s time for a break, kids can move over to the comfy seating area at the back of the van for a spot of relaxation. Complete with printed cushion and underneath storage for books, magazines, toys etc, it’s a great place to take it easy and read a book, play on the DS, or simply chat to friends. Ideal for ages 7 plus, the De Van® Blue Cabin Bed is a great space saving option for smaller bedrooms and provides an ideal haven to which kids can escape, relax and unwind for many years to come. Transform little ones' bedtimes into an exciting adventure. The elevated tree house design is ideal for a creative playtime whilst also offering a comforting and secure place for slumber. 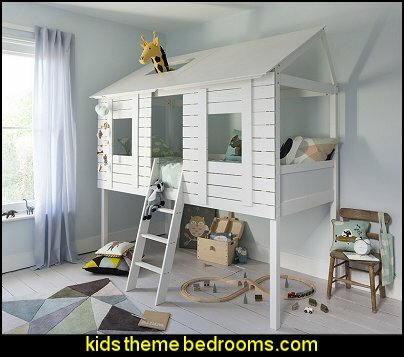 Hours of fun are to be had underneath the bed's canopy, which can also double as storage space for toys, ensuring that every inch of floor is utilised. 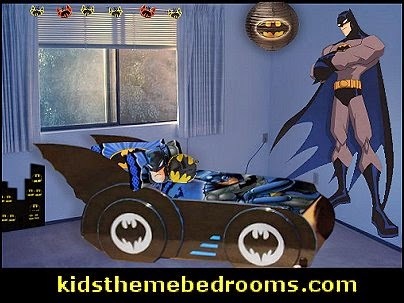 with the Ultimate Bedtime Experience! 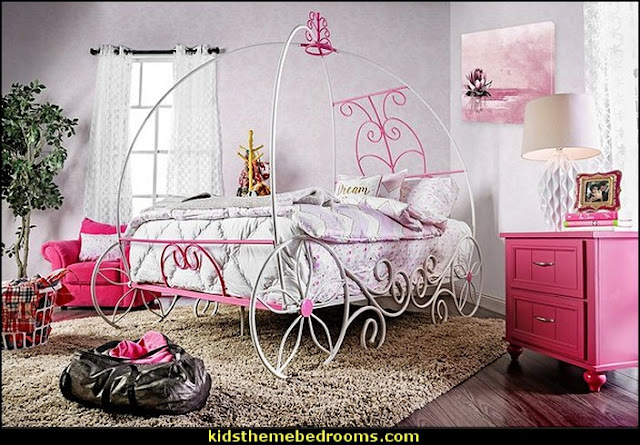 Your princess will love getting into her Princess Carriage Bed. It has a staircase on each side of the carriage and a curtain on top. The fun and exciting carriage bed is finished in shabby chic shades of pink making your little girl truly feel like a princess! 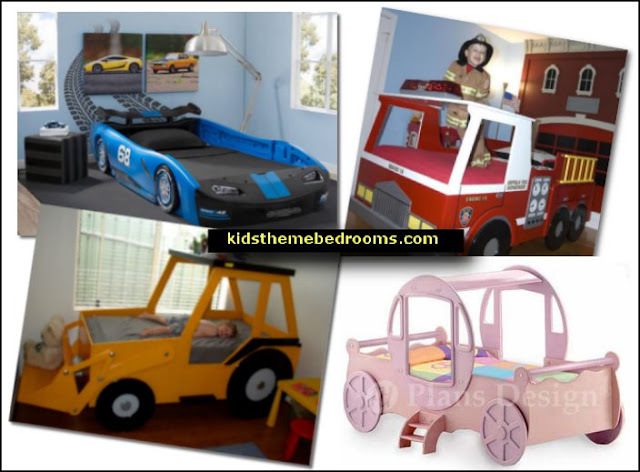 What fun car beds for the little speedsters. 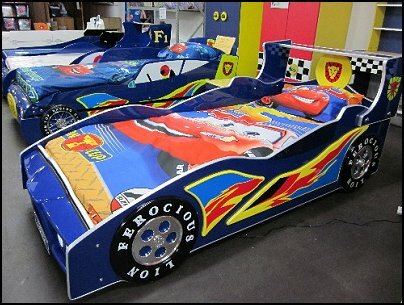 Little girls will be over the moon with these cute Racing Car Beds. Its Girl Power all over! Designed for the girls is ready to cause pandemonium. The headlights can be turned on and of on these little beauties. Low to the ground with high sides. Perfect for kids straight from the cot. It has 3D wheels for a realistic feel. Great bed for the little soldier. where the water is blue, and the treasure is shinny. Every kid dreams of being a hero. For one of the dream come true wonders, this bed really takes magic to a new level. 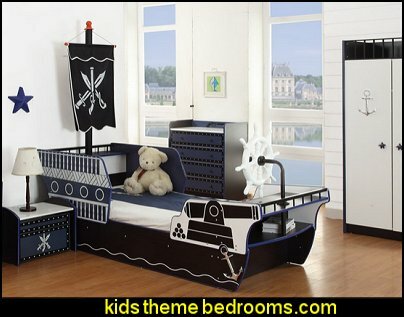 This bed embodies all the magical pirate elements. 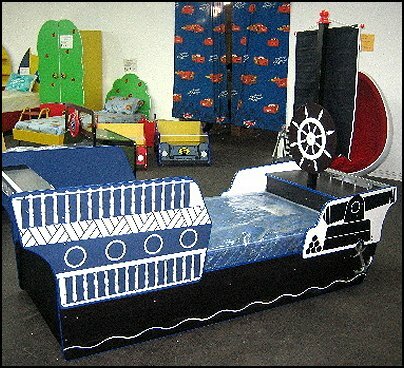 Unique designs featuring themed flags, decorative side cannons, and anchor shaped bed front let your kids take the wheel of their own adventure. Set sail for an adventure at bedtime! 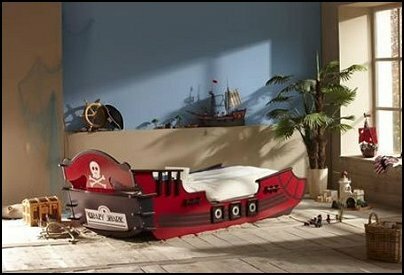 The Pirate Ship Bed invites your little pirate’s imagination to sail the seven seas in search of treasure. This unique design features a sail on a mast, a ships wheel and “wave” sides.